Front of the recipe card for Noodle Casserole With Eggs Ham and Cheese. 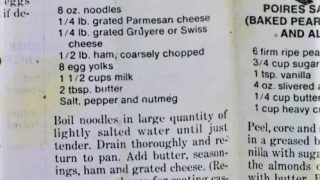 There are lots of fun recipes to read in the box this recipe for Noodle Casserole With Eggs Ham and Cheese was with. Use the links below to view other recipes similar to this Noodle Casserole With Eggs Ham and Cheese recipe. 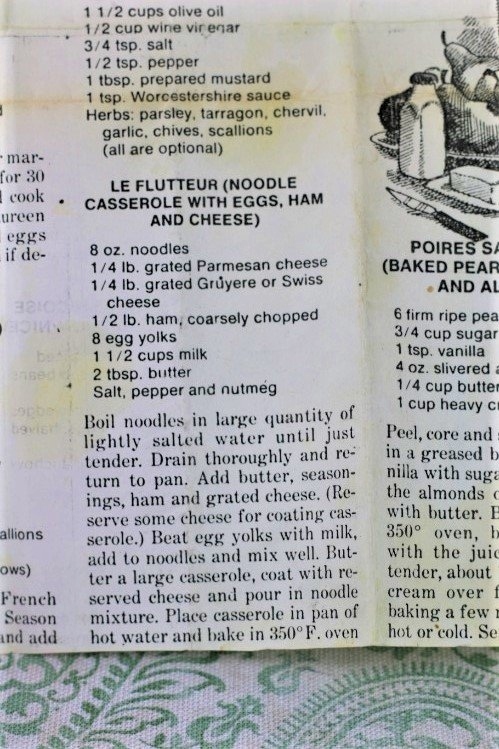 If you make this Noodle Casserole With Eggs Ham and Cheese recipe, please share your photos and comments below! Boil noodles in large quantity of lightly salted water until just tender. Drain thoroughly and return to pan. Beat egg yolks with milk, add to noodles and mix well. Butter a large casserole, coat with reserved cheese and pour in noodle mixture.